Milestones | Thubrikar Aortic Valve, Inc. Completed feasibility studies of Optimum TAV and the delivery system in 6 chronic and 8 acute sheep, and 1 chronic pig. 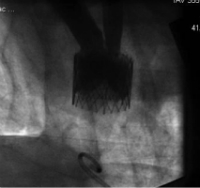 Implanted Optimum TAV in the aortic position, in the brachiocephalic artery, and in the descending aorta. Optimum TAV and the delivery system worked well. Optimum TAV stayed in place and showed normal function, with good healing and no adverse reactions. In 4 sheep, with our valve in the aortic position for 90, 145, 145, and 161 days, the data on the pressure gradient and valve function looks extraordinary, and superior to any data published on a TAV. Optimum TAV has completed more than 890 million cycles with ΔP ≥ 100mm Hg, surpassing the ISO/FDA required 200 million cycles. Executed a license agreement with Labcor Laboratories to fully sponsor a clinical trial of the Optimum TAVI system in Brazil, and commercialize throughout South America in exchange for a royalty. The Company expects to obtain First-In-Human data from the Brazilian studies in 2018. Executed a license agreement with WideLine to fully sponsor a clinical trial of the Optimum TAVI system in China, and commercialize in Mainland China and surrounding areas in exchange for a royalty. The Company expects to obtain First-In-Human data from the Chinese studies in 2019. Multiple patents for Optimum TAV granted in the US and Canada, and pursued in Europe. Patent directed to catheter-delivery system to be filed in 2018. Demonstrated an Effective Orifice Area of 2.1 cm² for Optimum TAV (compared to 1.9 cm² for the surgical valve used as a control). Implanted 2 cadaver hearts with Optimum TAV frames. These experiments closely represent the implant of Optimum TAV in Aortic Stenosis (AS) patients since the cadaver hearts had mild to moderate AS. 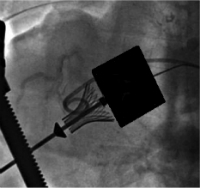 In both cases, Optimum TAV’s frames were implanted below the coronary ostia and above the left bundle branch, and did not impinge on the mitral valve. The frames were delivered to the correct position repeatedly using the Company’s delivery system and were anchored firmly in place; significant force could not move them. Completed finite element analysis studies of frame fatigue.